I've never really been a trainer kinda girl until I fell in love with my Converse, its always been ballet pumps or heels for me. 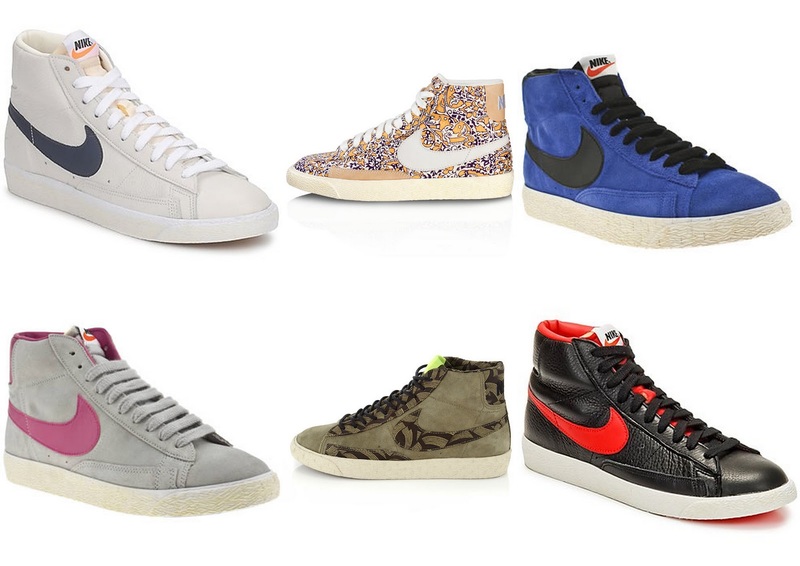 Nike Blazers seem to be the new trend and until recently I always thought these were a shoe for men, not for women. While I was in Nandos the other week with Holly I noticed that quite a lot of the girls were wearing them (dressed down) and they looked so cool and obviously guys with swag wear them. I did a quick search and the amount of styles you can get considering they're literally only a trainer (I better not say that to the fashion conscious male or I may offend) is mind boggling. I know women are bad with shoes but I never knew men were as bad!! Personally I'm thinking I should invest in either the Liberty x Nike Blazers or the grey and plum suede ones. Probably the reason why I'm drawn to these is that they're are the girliest ones I can find without being overtly girly. What are your thoughts on Blazers? How do/would you style them? i wanted to grey suede with pink tick but couldn't find my size so ended up just getting black nd white ones, but seriously get them. so worth the 60 quid and are so comfy! !